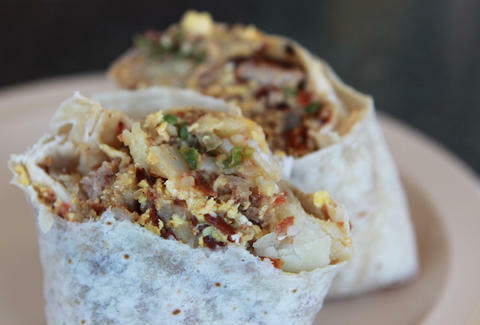 So, earlier this week, we published a list of nine of the best breakfast burritos in LA. And though we stand by that list (fully, those burritos are, like, amazing), we also know when to admit we're wrong about something. So let's give it up for the breakfast burrito at Corner Cottage in Burbank, a burrito we egregiously left off of our best breakfast burritos list and aren't afraid to say so. But what makes it so good and worth standing in line for hours for (like a bunch of people do on the weekends)? Jalapenos, for one; density, for two; ratio, for three; and, more than anything, the chop -- a smartly minced knifing that ensures a good mix of ingredients. Top it with their homemade hot sauce, and bingo bango: another one of the best breakfast burritos in LA. For sure.